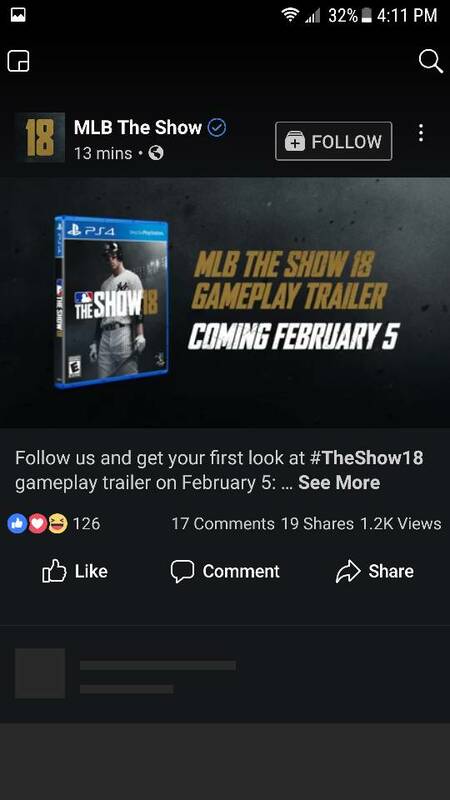 The hype train starts on Monday, February 5, as we get to see a gameplay trailer from MLB The Show 18. More details should come shortly after, with Twitch streams with the Producers being scheduled. 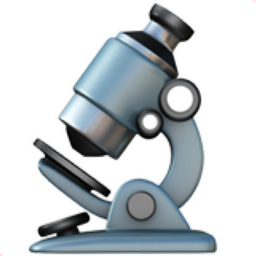 Everyone get your microscope ready! I bet $100 the gameplay in this trailer graphics specifically look exactly like MLB The Show 17! Stoked about this! And the day after my birthday! Can't wait! How about I don't follow you and I still see the gameplay video, K, thanks. I couldn't care less about the graphics it's good the way it is now anyway. they just need to fix other issues first. we won't get another graphics upgrade will a new system or engine. Gameplay trailers are usually lots of cinematics and very little gameplay. Still, i'm happy we finally get to see something of the new game. Nice to see what’s going to be new for 18. The trailer will more than likely be from a old build but people will still freak out and say it looks to much like 17. It's almost party time, boys. I'm hoping it's one of those trailers that's sort of a broad overview/highlight reel of the new features, but I'm just happy the live streams are almost upon us. People always say this, but the game always ends up looking pretty much the same as those early trailers. Here's hoping they added and made changes to the gameplay and improved the career mode. Although last year they did make a few improvements to player models with body sliders, jersey sleeve length, and improvements to faces, so hopefully they continue to improve this year. I dunno man. Go back and play 14, the graphical progression they've made over the years is actually pretty remarkable IMO. Granted, they had more ground to make up for than say, NBA 2K (compare 2K14 to The Show 14 if you don't believe me), but they've still made a lot of progress over the years. 17's faces alone were a huge upgrade. The lighting has come a long way for sure. Other than better faces and more varied body types, not much else has improved graphically since the PS3 days. My personal biggest issue graphically is still the stiff uniforms that animate the same way they did 10 years ago on PS3. Why can't this game get current-gen cloth physics that move realistically based on player movement and wind? MLB 2k8 even had (a very rudimentary version of) this, but for some reason it can't be utilized and improved upon a decade later when just about every other sports game has it? When/if The Show ever gets it, the game will truly look current-gen. But until then, the player models will always look like higher res PS3 models to me. It's, in my opinion, the only thing that is still holding this game back graphically from the level it achieved in the PS3 era of being one of the very best looking games of that generation. I see what you're saying. I'm more of a fps junkie, and when I first picked up 14 (it's the game that sold me on a PS4) I was fairly disappointed, coming from the 60fps splendor that was 13 on the PS3. 17 on PS4 Pro is almost there, but I'm not sure how many folks are willing to invest in a new console to see the improvement. And yes, I've those videos of cloth physics in earlier MLB games. Pretty amazing stuff, would love to see that implemented in The Show. I love Madden's graphics with the frostbite engine. Needs something like that. I'm also a bit of an FPS guy. Bought a PS4 Pro just to play The Show in a high framerate. It's definitely good but still not quite perfect. Not sure the actual rate but I'd guess it's around 45 fps. Doesn't quite feel like a solid 60, and there are occasional drops here and there, especially in cutscenes. I do feel 18 will improve on this significantly and hopefully get 4k mode up to a playable level, because that's where the game really stuggled for me. The best thing about the Pro for me though is HDR. Honestly that was the biggest graphical difference difference I had seen in years. Before 17 I was one of those guys that complained about the grass and jersey colors always looking dull, but when I played 17 for the first time and saw the way it looked with HDR, I couldn't believe the difference in the vibrancy of the colors. Truly a night and day difference. Active gameplay (by which I mean when the pitcher comes set to when the play ends, be it with the ball in the catchers mitt or when a play in the field ends) is 60 FPS on the Pro - I'm certain of that. It was my biggest hangup with the game last year and I've not noticed one hitch in a pitch's delivery all year - that's no exaggeration. You're right that many cutscenes dip lower, as well as pre-pitch before that little graphical "pop" happens - that pop is the game reducing its graphic overhead so it can deliver 60 FPS during the pitch. That's why crowd models, shadows, and other things change in certain stadiums - it's especially noticeable in some stadiums' behind-the-pitcher cams. Games are absolutely capable of locking framerate at a lower setting when their appearance is more important than their playablility - NBA 2k on the PC has had a "Dynamic VSync" options setting that limits framerate in cutscenes to 30 FPS, but maintains a smooth 60 during actual play. So I don't think you can really say "The game runs at x FPS" without saying which part runs at "x" FPS. I run in High Frame Rate mode because that's the only option I have with a 1080p TV. YMMV if you're 4k or Enhanced mode. I know you mentioned 4k in your post but you didn't say which mode you were using. I know the above wasn't addressed to me bcruise, but I play strictly in High Frame Rate mode. Haven't switched it since I bought my Pro. Active gameplay (by which I mean when the pitcher comes set to when the play ends, be it with the ball in the catchers mitt or when a play in the field ends) is 60 FPS on the Pro - I'm certain of that. It was my biggest hangup with the game last year and I've not noticed one hitch in a pitch's delivery all year - that's no exaggeration. You're right that many cutscenes dip lower, as well as pre-pitch before that little graphical "pop" happens - that pop is the game reducing its graphic overhead so it can deliver 60 FPS during the pitch. That's why crowd sprites, shadows, and other things change in certain stadiums - it's especially noticeable in some stadiums' behind-the-pitcher cams. Ah okay, I didn't know the actual technical specs on it, maybe I was just experiencing it in the cutscenes and transitions to and from them and thinking it was everywhere. It's definitely noticeably smoother than how 16 felt on a regular PS4. I'm definitely not trying to downplay it, glad to hear it is a solid 60 fps during actual play. As for 4K, I've tried playing in 4K Mode and can't do it for very long. The image quality is great, but it has a very choppy and inconsistent framerate. It's very difficult to do anything since so much of this game involves timing, and trying to time the pitch meter or an incoming fastball is next to impossible when it feels like you only have about 5 frames to work with. Needless to say I play much better in HFR mode, even though I play most of my games with Enhanced Visuals mode be cause the 1440p looks absolutely fantastic without having to sacrifice too much of the framerate. I'd say it feels about even with the way a base PS4 would but with a much crisper image. These guys agree with you! I didn't see that devs spitting hot fire was part of the trailer announcement for Monday. But, this has now been confirmed. The other guy sayin' it's like higher res PS3 graphics is not accurate to say the least.. but what he said about uniform cloth physics is something your development team should consider. Maybe you have considered it. Maybe it's too much of a change to introduce into the current code structure.. Maybe it'd impact the framerate too much.. I agree. I really am not a nitpicker on the graphical side of the game, but the body types and jerseys having little movement are starting to age. While this game unquestionably has improved graphically on the PS4 it imo has had a smaller leap then games like Madden and 2k. Look at 2k13 on 360/ps3 and then 2k14 on XB1/PS4. Its a generational jump. Same cant be said about the show. I know different dev teams, sizes, etc. That's all I was saying, that the cloth physics on the players hasn't really been upgraded since the ps3. Not that the entire game hasn't been upgraded. Maybe I should have worded my first couple sentences differently, because the rest of the game looks phenomenal, but the dated cloth physics hold the game's overall look back in my opinion, since the players are the focus. Like I said, it's the only thing thats holding the game back graphically from being on par with its previous glory graphics wise. "Other than better faces and more varied body types, not much else has improved graphically since the PS3 days." I meant to say that was referring to the player models, but for some reason didn't specify. The rest of the game looks amazing. The stadiums, lighting, the physically based rendering make the game beautiful. The players are the only thing I think could still use improvement. I think you're just proving that guy's point with this video. Which guy and which point? I am not worried about the look as much as many..happy enough with it. I want liners up the middle to NOT bounce off the pitcher for an out game after game... for catchers, pitchers and 3rd basemen NOT make play after play on a dribbler- every once in a while throw it away..eat the ball. I would also love to see some big gun. outfielders throw someone out at second as they stretch a single into 2... of course AI pitcher logic needs to be worked on a bit, especially the use of the relievers and innings for starters... but don't get me wrong..with 35 games to go in my season before playoffs, this is the ONLY game I continue to play for a solid year every year...hands down keeps me involved more than Madden has the ability to...now when NCAA Football comes back...all bets are off! Seriously, I for one enjoy the hell out of The Show and it's the only reason why I added a PS4 2 years ago to my xbox set up. I agree, the cloth animations could use some attention to make the game have a big jump graphically. Last year the face scans blew me away and finally looked "next gen" to me. I'm hoping the cloth physics can do the same. I'd be curious to see where the graphics would be if they concentrated their resources on player models at the initial release of the PS4 instead of focusing what seems like most of their attention on the stadiums. Luckily I'm not a huge nitpicker on graphics, I just wanted to back the guy who recommended better cloth physics, seemed like he was getting a little heat from the developer. which he has since recanted. Is this an admission that cloth physics cannot be implemented in the current generation? Not sure how you came to that conclusion, but it sounds like a confirmation that it won't be in '18 at least. The trailer will be something to see but I’m really looking forward more to the twitch streams and blogs. The reason it dosent look generational is because the player models look exactly the way they do on PS3. SDS did not write over older code they jus transfered it from the PS3 to the PS4 without writing very much new code other then for some stadiums is what i think ..
That the game dosent look much different on the PS4 ..
Im not worried about graphics other then player models as i think if yall would have changed them with the move over to the PS4 or atleast by now which is what the 4 or 5 the game on PS4 the game would look so much more spectacular not to say it dosent now .. With new player models comes different looking to the eye anyway of the way a hitter swings the bat pitches the ball fields the ball .. As these player models look so outdated and the way they do things on the field as well .. My most concern is adding Create a stadium/expansion/relocation upgrades to franchise have wanted that option every year since MVP 05 .. At the very least Add DD offline with relocation/expansion .. I remember the developers releasing a video detailing the improved shader routines written for the PS4 version. I'm pretty sure player models have a higher polygon count on the PS4 version too. At the core, yea, I guess the player models weren't completely remade for the PS4 though, so they look the same, but they really are not the same. Im sure they wrote alot of new code but player models havent received much or any .. What i would like is players bodies to look different from one another and i really wish they would mo cap different hitting angles and pitching angles as they are way outdated what i mean is the way the player looks when a pitch is coming out of a pitchers hand the way a hitter looks swinging the bat looks awkward .. Player models do need work and so does cloth physics. However expecting such changes are unrealistic when last years game was a disaster. They probably spent most of the time fixing online problems and made changes to franchise due to backlash...oh and lets not forget they spent all the same adding new bat flips just so they can show em off during the gameplay trailer on Monday. Well to be honest the video you posted really didnt prove the point i think you was trying to make .. As in the video you can clearly see the player models look the same.. I know yall have done much work to the game besides jus porting over from the PS3 .. I jus wish yall would have started from scratch and rewrote all the material for player models and espicially commentary .. I cant wait till Monday to see the new trailer and like always ill be buying the game have every year since MLB with 989 sports .Hoping for Franchise, RTTS improvemeants along with Expansion/Relocation In DD offline or DD in season mode ..
Look, I don't want to undermine your team's effort in any way, I know you guys put in a ton of work every year to make the game as great as it can be and you do a fantastic job. Really. But if you're implying that there's a drastic difference in the look of the player models in that video beyond a higher resolution and better lighting, then maybe I really am blind. Well to be honest the video you posted really didnt prove the point i think you was trying to make.. I jus wish yall would have started from scratch and rewrote all the material for player models and espicially commentary.. When you say "material for player models", do you mean you wish they would've remodeled them? They import them from a modeling program into the game. I don't know how many different models they have since it's possible to scale different parts of the body model and change the color of skin and uniform material within the game, but I would assume it isn't just one model for all the actual MLB players. Yes remodeled from new code .. There's no code to remodel a player. Tomorrow, tomorrow, I love you....tomorrow. Your only a day away. ok Super Bowl over now it is officially baseball season time!! woohoooo give us that trailer now! Not really expecting much with the trailer tomorrow since they usually don't show a lot. Pssh, they have a chance to show all the new bat flips. Pretty clear that they were waiting to finish this competition before they release the first trailer. I think part of the fun is when OS takes the early crumbs handed out by the devs and elaborates them into 8 threads, 2 gifs, 13 screenshots, and several new hypotheses about the game within 24 hours. I am not being sarcastic. It's pretty impressive, all the little things people notice. The trailer will be hints to the new stuff being added. It’s always fun on OS seeing what people pick out of the trailer. Love when the SuperBowl comes and goes. Means that baseball is right around the corner and pitchers and catchers are getting ready to report. Excited to see the Gameplay trailer and upcoming news about the game. What is everyone hoping to see? New online system will be touted since last year's was a mess. I also think they are going to bring up new road to the show story modes and franchise additions, such as a full budget system. I'm going in with the hope that we get some sort of brief overview as to what was the focus for the year and then a timeline of when they will discuss in-depth those additions/changes. My hope is it is a true sizzle trailer and we get some nuggets of franchise upgrades. And I hope we get Twitch schedule this week........ Fingers crossed! The wind chill index is 0 degrees. We got 3 inches of snow last night. We're getting 3 more inches of snow tonight. We're getting 3 more on Wednesday. I'm very unrealistically hoping for an Expansion/Relocation/Rebrand feature for Franchise. Hopefully this is the year they focus on single player modes and not Diamond Dynasty. I want loose cloth physics. 2 years ago, one of the things I wanted most was better stat-tracking and they promptly delivered on that. Albeit, not perfect, it was an enormous upgrade on the threadbare stats that had been tracked up to that point, both intra-season and inter-season. Last year, I wanted the ability to carryover save whole rosters or be able to plug and chug different players into an existing franchise. Also, I wanted a beefed up front office/budget/contracts system. Instead, we got quirks and cash flow (although ball fizzicks was very nice and I can't complain about that). This year, I really want them to mean it with franchise mode. There's so much untapped area where the game falls significantly short of real life, both in-season and during hot stove season. I would like them to close that gap by a significant amount this cycle. Can't wait to hear about all the stuff that we were told was great last year and how it's not as good now and to instead hear all the stuff that's better now that will in turn get talked about negatively by them next year. Seriously, rebuild the engine completely, or just put out thoroughly researched rosters every 6 months. The insult isn't suggesting that we buy a new game each year, it's in suggesting that you've done anything different.